Have you ever felt nervous about playing your guitar on stage (or in front of other people)? Of course you have… almost everyone has! But it doesn't have to be this way. When you learn to practice and prepare for live guitar playing the way the pros do, you will have a lot more fun every time you play guitar for other people. Avoiding the common mistakes guitarists make when preparing to play guitar live that sabotage your performance. 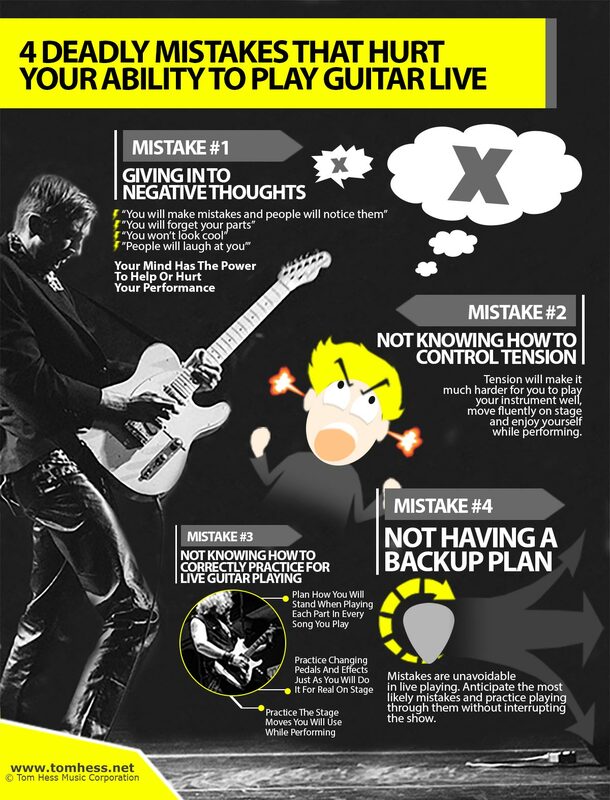 Most guitarists allow negative thoughts to control their mind, causing them to make more mistakes. Here is the secret most people don’t know: your mind cannot tell the difference between the things you want to happen and the things you don’t want to happen. Your mind only understands (and moves you towards) the things you consciously focus on. So when you think how embarrassing it would be to forget your musical parts or make mistakes on stage, your mind causes your body to tense up and actually make more mistakes. What you focus on becomes your reality. Solution: To make your live performances go better, visualize yourself performing at your very BEST in the days leading up to the performance. See yourself playing perfectly, without mistakes and enjoying every moment of it. When you do this consistently, your anxiety will be replaced by confidence and excitement. Note: Of course this positive visualization is NOT a replacement for learning to practice guitar correctly for live performance. That said, it absolutely will give you a strong advantage when it comes time to playing your guitar in front of people. By focusing your mind on all the things you don't want to happen during your live performance (causing you to tense up in fear). By ingraining bad technical habits while practicing guitar (without realizing it). Until/unless you learn to release this extra tension, playing guitar live will continue to be very stressful and challenging on both physical and mental level. By having specific and effective strategies for training your hands to play guitar without excessive tension. This eBook on how to double your guitar speed will help you do this. By developing a mental ritual to follow before every live performance to release anxiety and tension from your body. (Note: this is different from releasing tension during your general practicing.) One great way to do this is to remind yourself of the reason(s) why you are about to play in front of people. You are NOT playing live to “be perfect” or to impress anyone or to be judged by others. You do it because you love music and are excited to share your love with your audience. This shift in mindset will help you to be at ease when performing. if you're suffering from stage fright, you must read this article. If you play guitar professionally (on a stage and/or in a band with other musicians), you must do a lot more than simply work on your individual guitar playing. You (and/or your entire band) must rehearse the actual logistical process of the stage show itself. Not doing this is a source of many mistakes, anxieties and frustrations about performing live (and it makes you and your band look amateur). When and how you will change amp settings. When and how you will change your pedal settings or midi controller. When and how you will tune your guitar OFFSTAGE (whenever possible). Memorizing the spots on the stage where each band member stands during each moment of every song. Understanding where your performance position needs to be at every important point during the show. Your stage presence during the show. What every member of your band does in between songs. Communication between band members on stage. The more detailed you can be, the better. Make your own list of things to prepare for depending on your needs and then rehearse the actual show to develop rock solid live guitar playing skills. No matter how well you prepare for playing guitar live, realize that some mistakes will always happen during a show. Nobody can ever play guitar 100% perfectly 100% of the time (especially live). What you can (and should) do is anticipate how you will react to mistakes while you are on stage. If you don’t prepare for this in advance, any little mistake can make you lose focus, leading to even more mistakes and lots of frustration. 1. Identify the hardest part(s) in the music for you to play. 2. Identify the specific mistakes that can occur during those challenging parts. 3a. Practice in the best way you can to ensure that these mistakes do not happen. 3b. Plan/rehearse in detail what you will do to continue playing with minimum distractions if a mistake does occur. Dealing with the mistake mentally before it happens will ensure that it doesn't interfere with the rest of the performance and will make it a whole lot less likely that anybody except for you will notice it. When you combine effective guitar practice with a “fail-safe” strategy for playing through mistakes, you will greatly remove any anxiety from playing guitar live and will enjoy the performance a lot more. Now that you know the most common mistakes guitarists make when preparing to play in front of others, apply the advice for solving each one to develop your live guitar playing skills. To learn even more about how to play your guitar reliably and consistently and massively improve your guitar technique, check out this free eBook on how to double your guitar speed.